Wind power is a growing contributor to the energy grid but it has its limitations. Wind turbines need to be located in windy places and the structures are big, get in the way of things, and are rather costly. Some people believe that there is a better way to generate electricity from the wind: kite power. Winds are stronger and steadier at higher altitudes and harnessing the energy from those winds using kites, kite balloons, or even flying turbines has considerable promise. 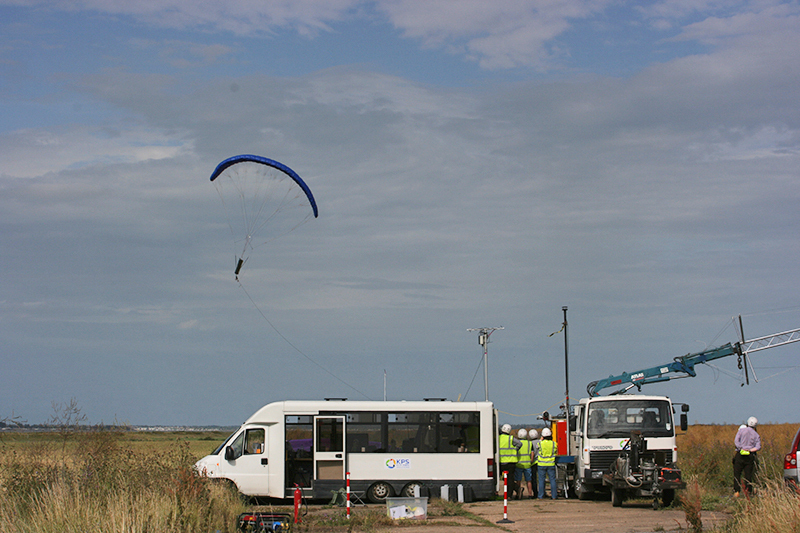 One of the world’s first commercial-scale kite power stations is going to be built in Scotland next year. Developed by UK-based company Kite Power Solutions, the system is composed of two kites that rise and fall in tandem, which spools a tether line that turns a turbine. Electricity generated is transmitted down the tether line. The kites will fly in a figure-eight pattern at an altitude of about 1500 feet. By having two kites working in tandem – with one going up as the other floats back down – the system can generate electricity continuously. This first system is expected to generate 500 kilowatts, enough to power thirty or forty homes. Future systems utilizing larger kites will be capable of generating 2 or 3 megawatts per kite, which is about the same as a 300-foot conventional wind turbine. Kite Power Solutions claims that the kite systems will be much cheaper than conventional wind systems – especially for off-shore installations – and the company is optimistic that they will have several hundred megawatts installed by the year 2025. Perhaps kites aren’t just for kids anymore. Photo courtesy of Kite Power Solutions. ‘Kite Power’ from Earth Wise is a production of WAMC Northeast Public Radio.